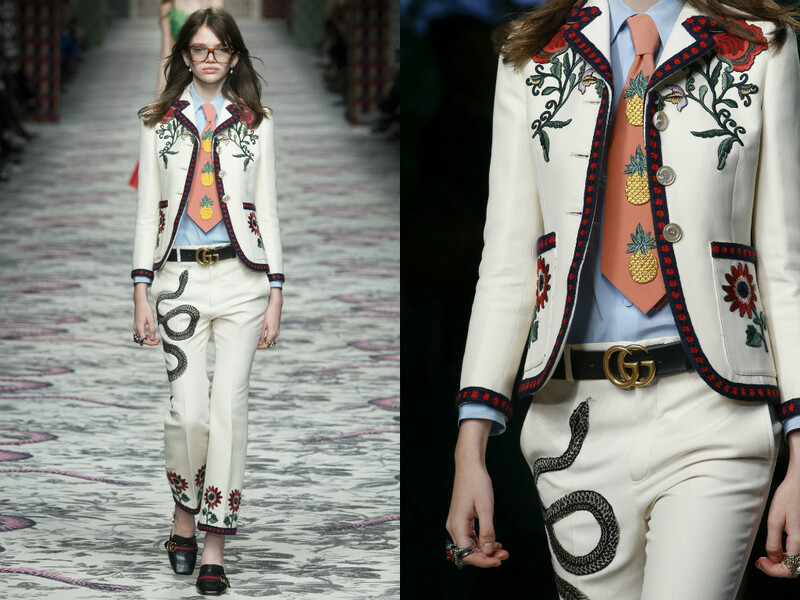 I absolutely love Gucci. 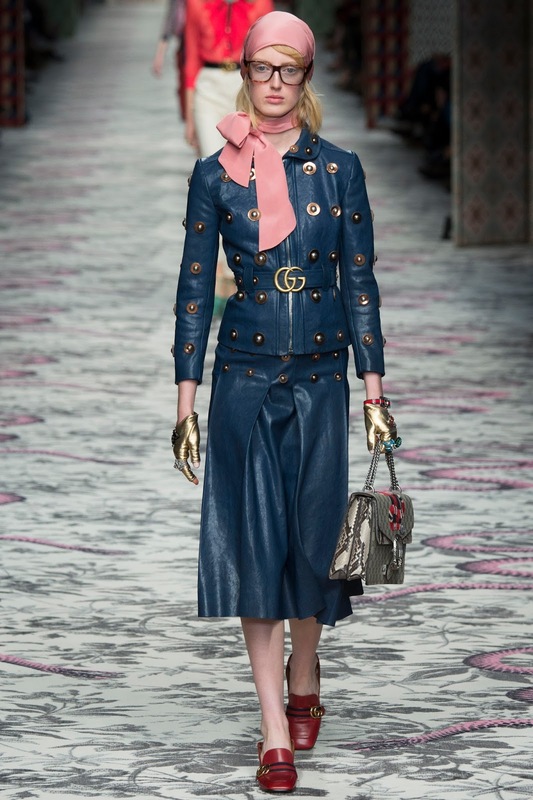 I think it's particularly different from other brands. 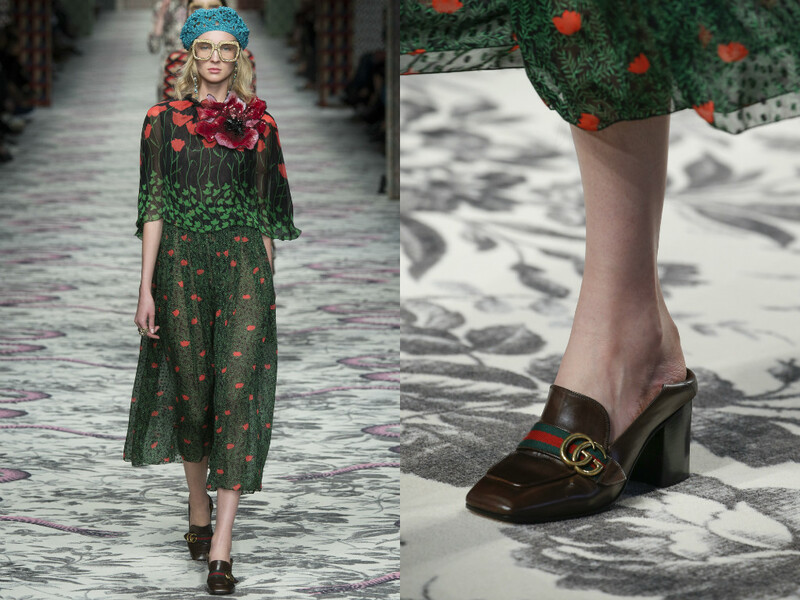 When I bought a pair of Gucci Horsebit shoes on Bond Street in London, I got talking to the lady helping me and she gave me a good insight to the background of the brand. 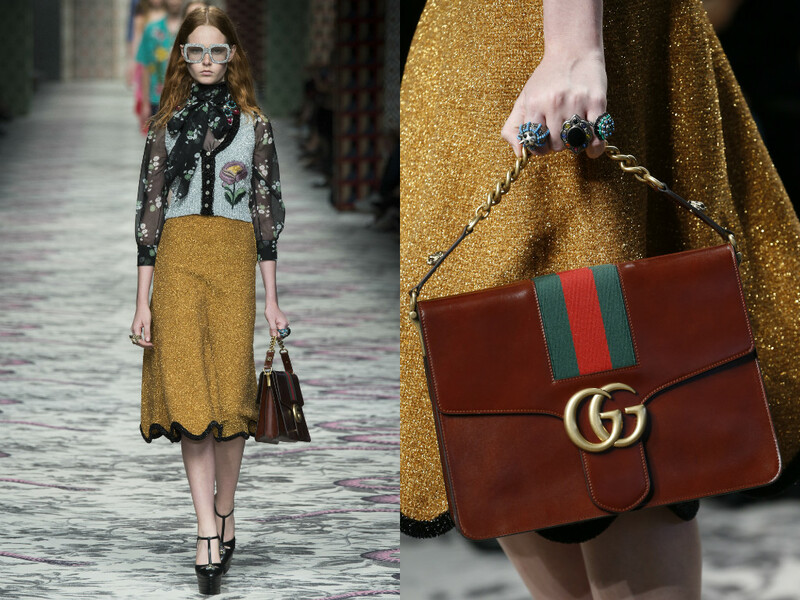 It was founded by Guccio Gucci in 1921 and started as a leather goods brand, selling good quality pieces and accessories. 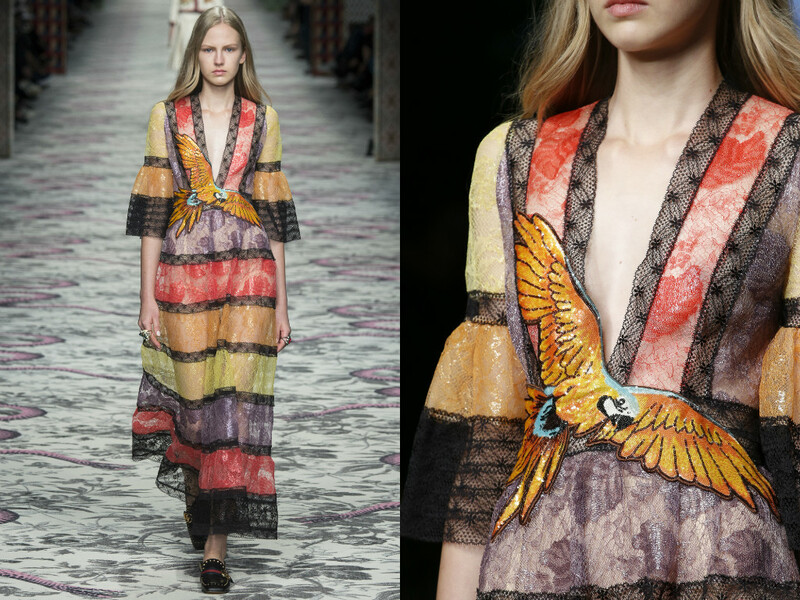 It's Italy's biggest selling label. 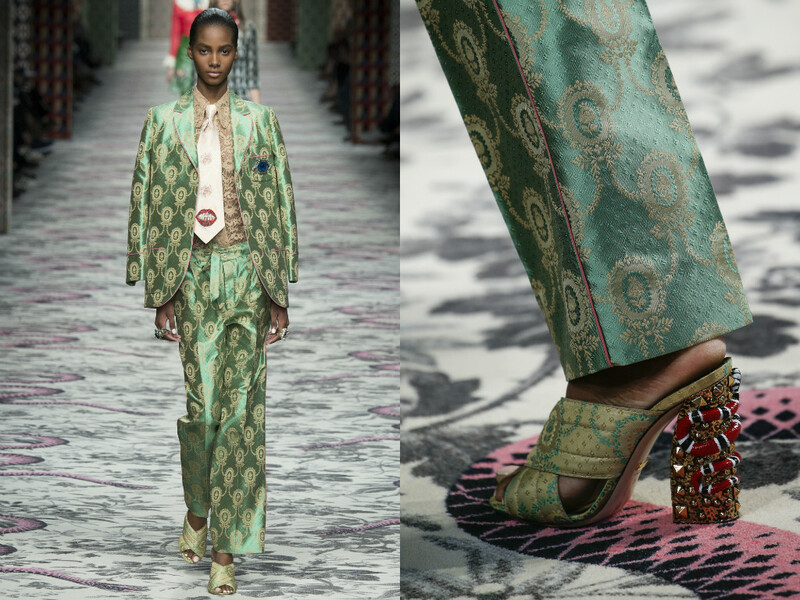 This collection is absolutely fantastic. 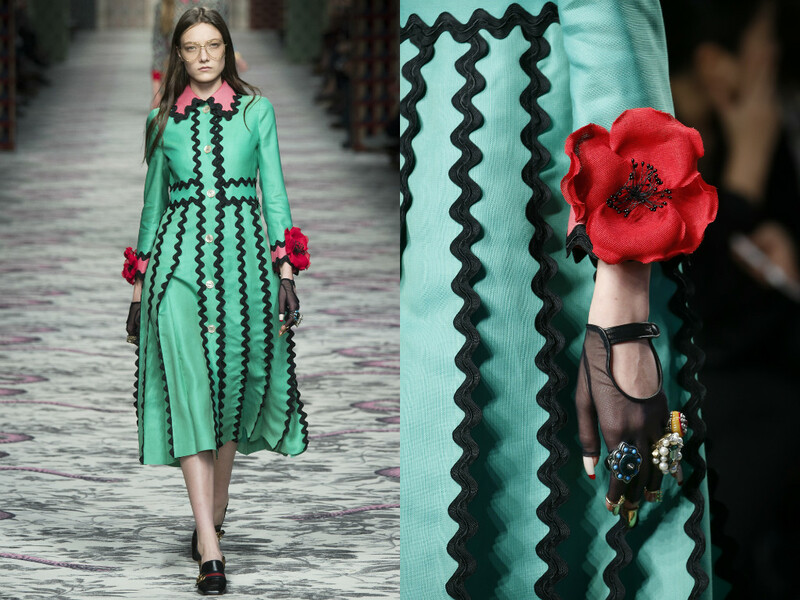 The detail, the colours and the Italian influence has been so well thought out and designed. 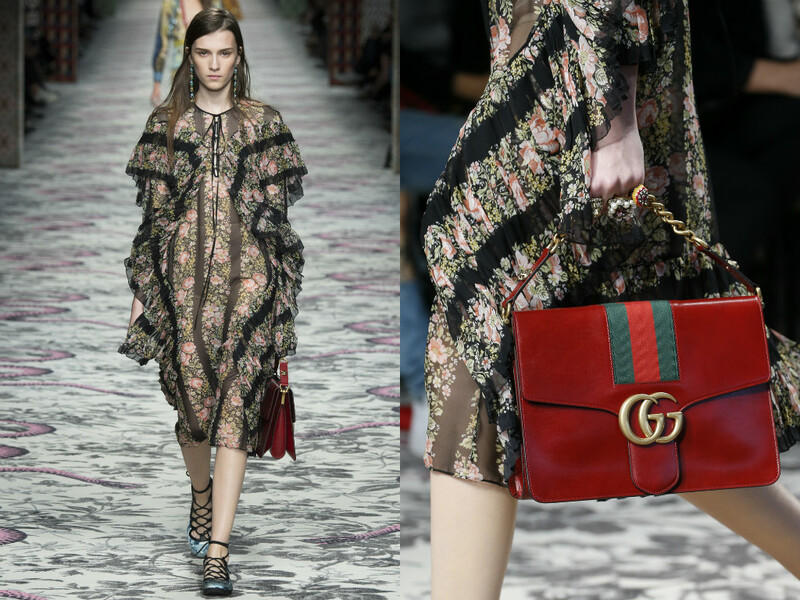 It was somewhat eccentric and "out there" which is perfect for some women, but I love the collection because you can take one piece from one look, and pair it with another piece from another look - and it just all works. 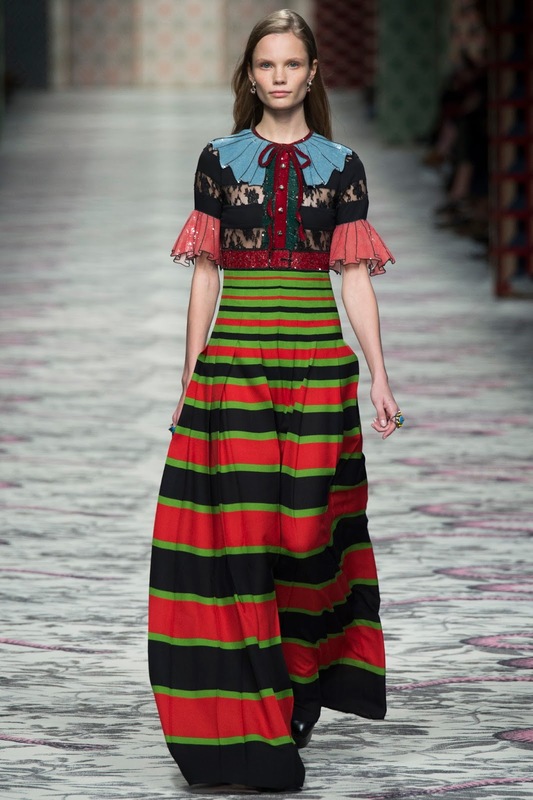 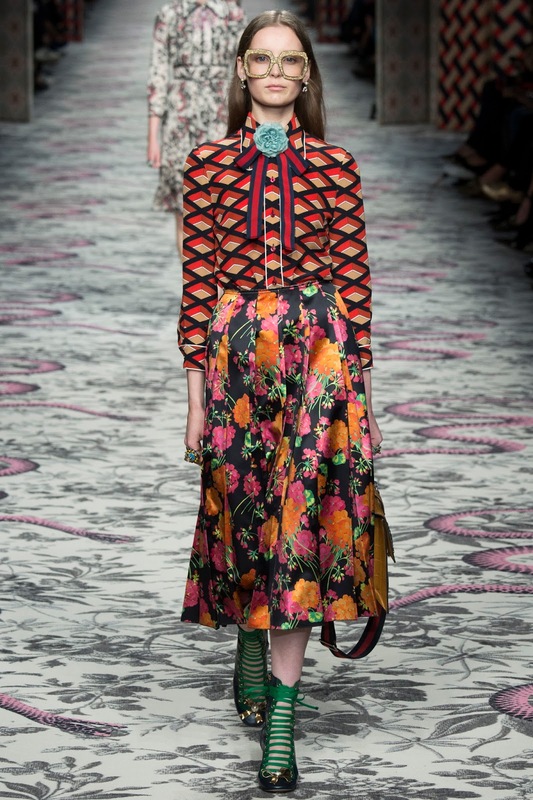 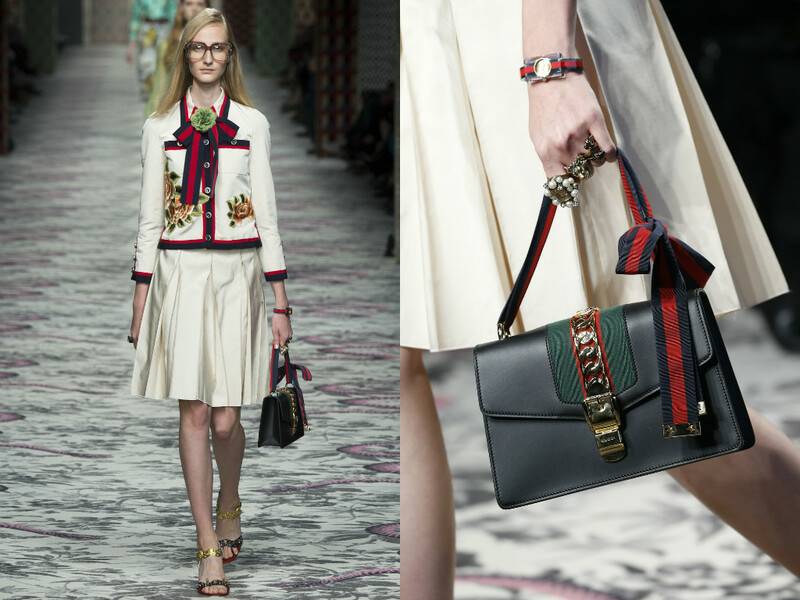 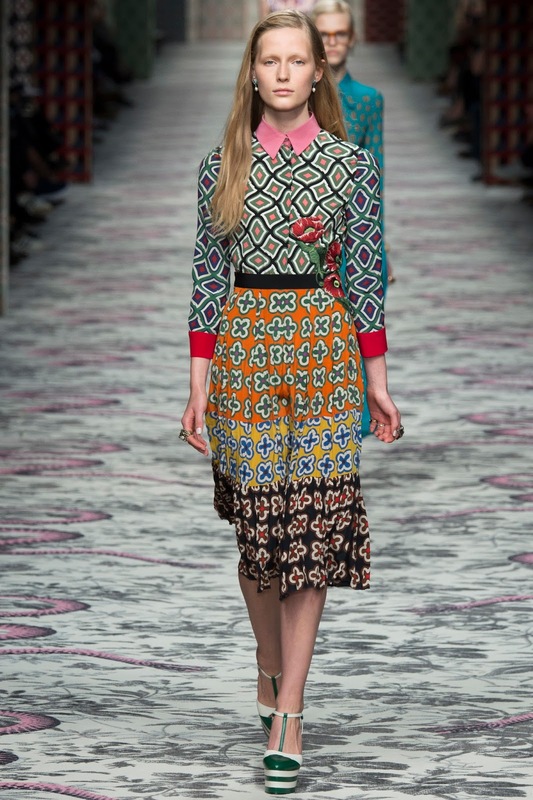 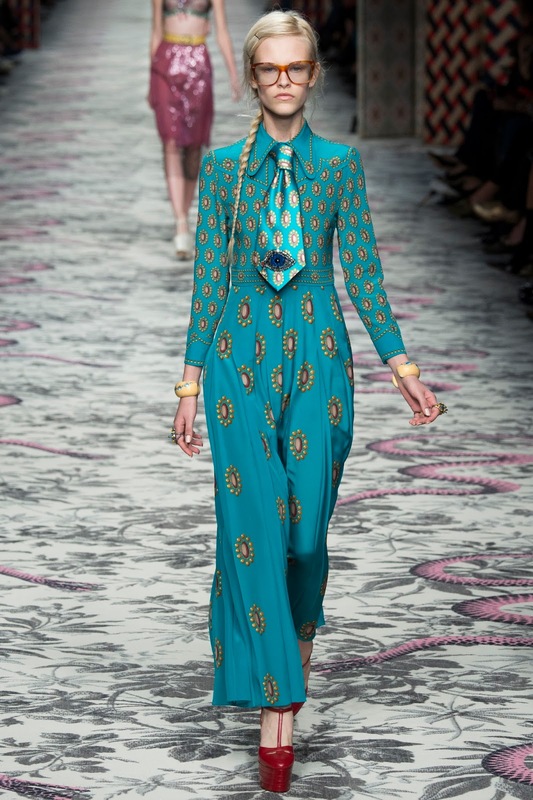 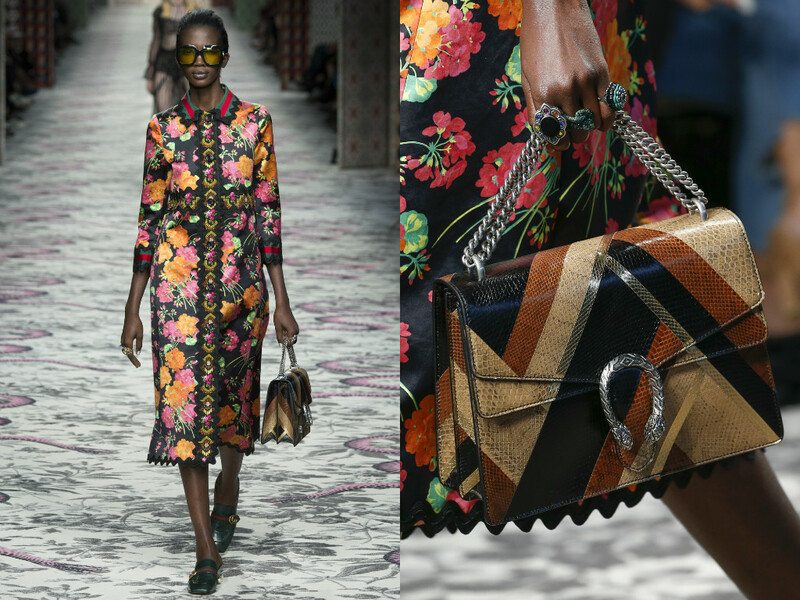 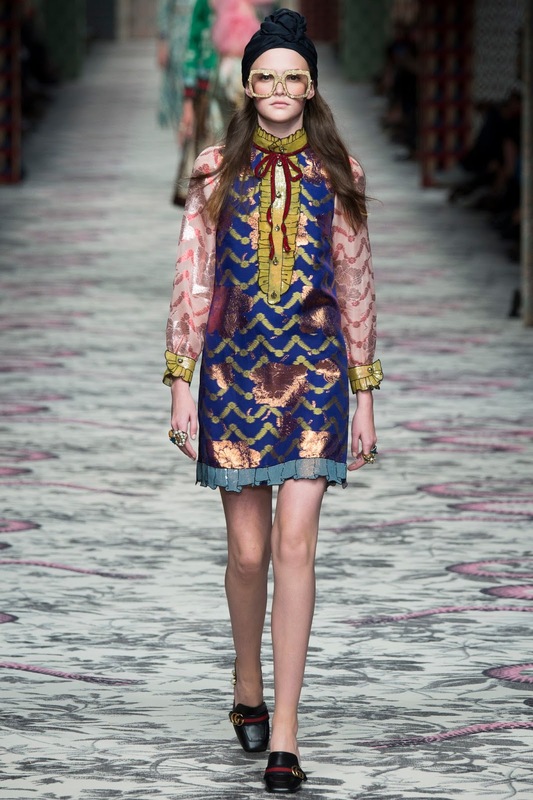 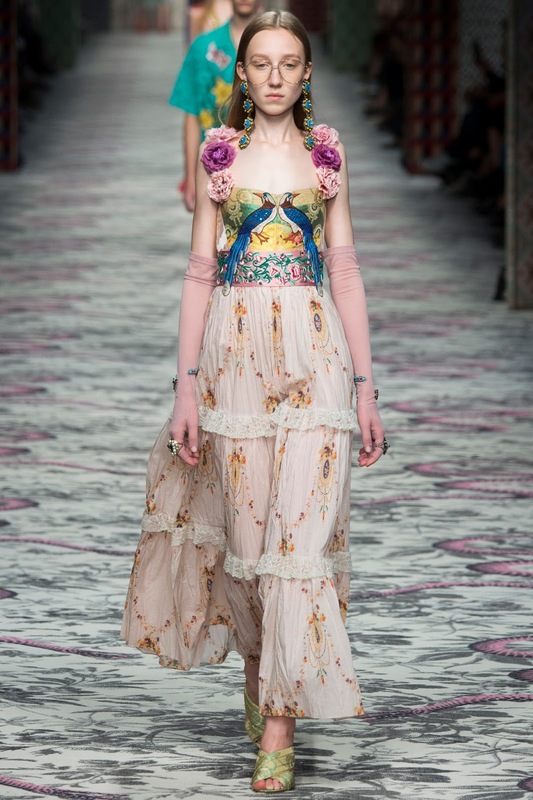 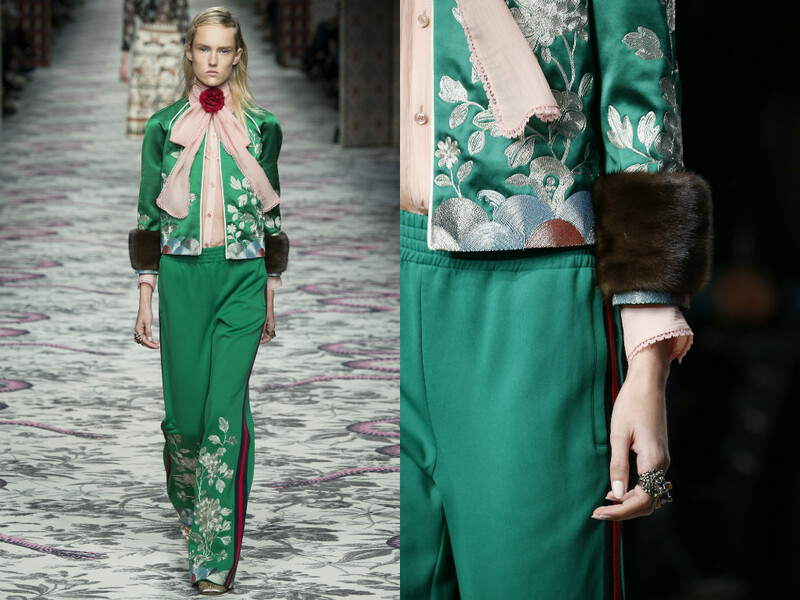 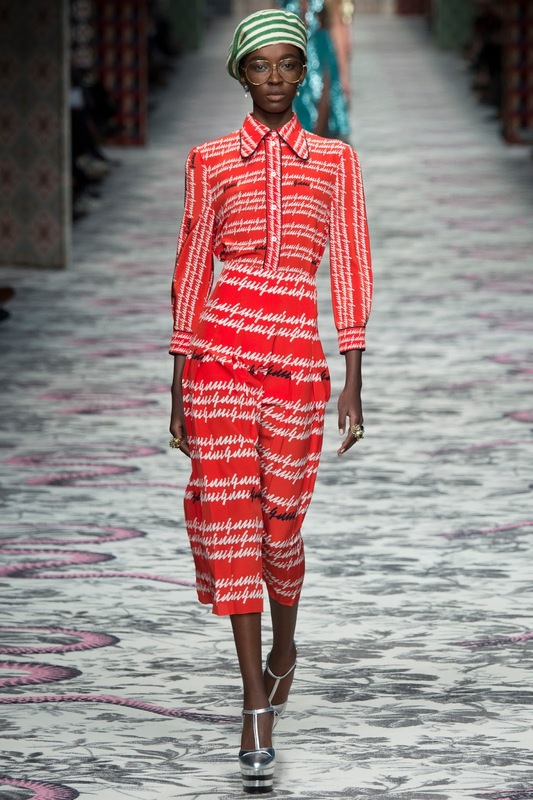 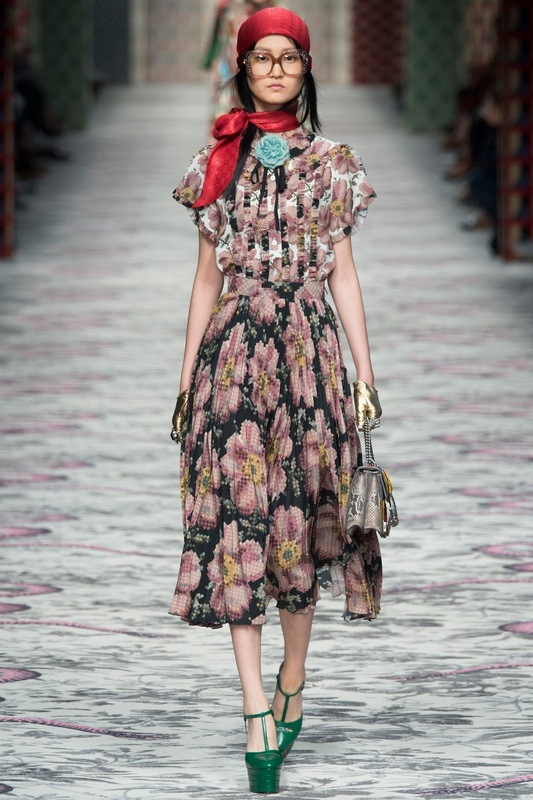 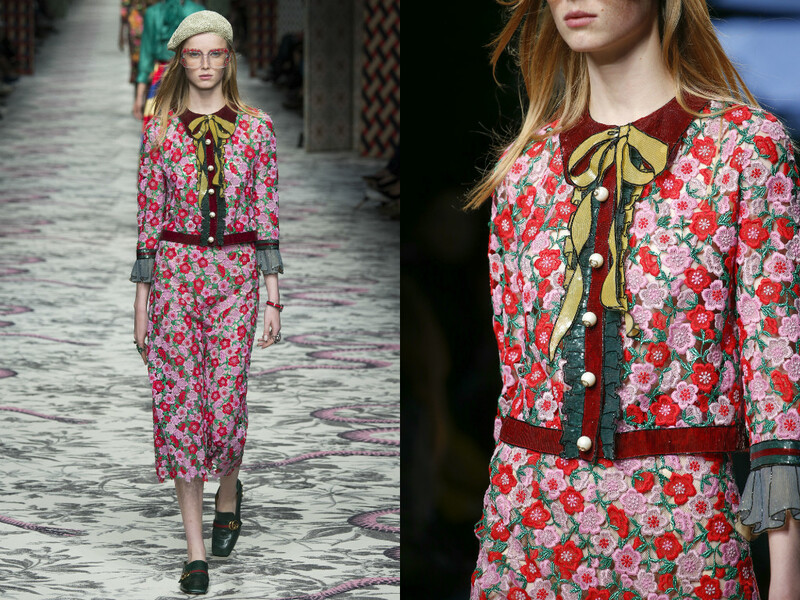 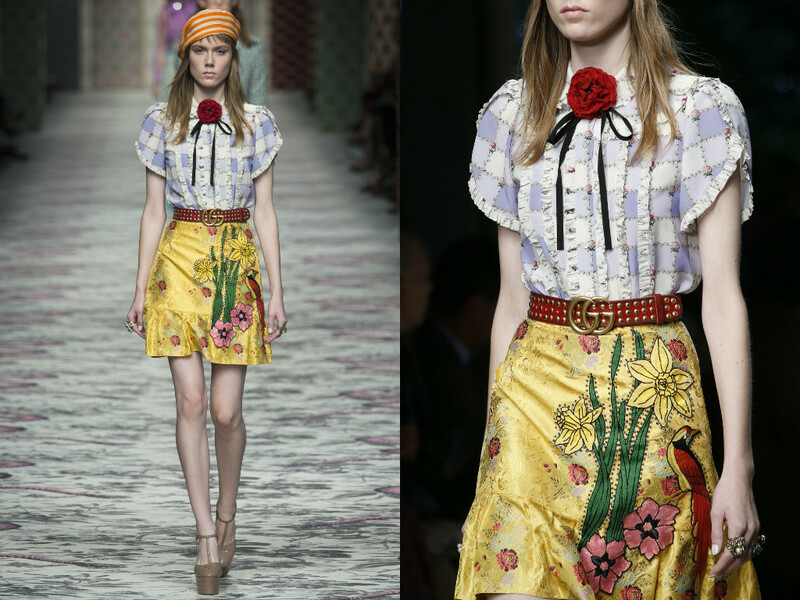 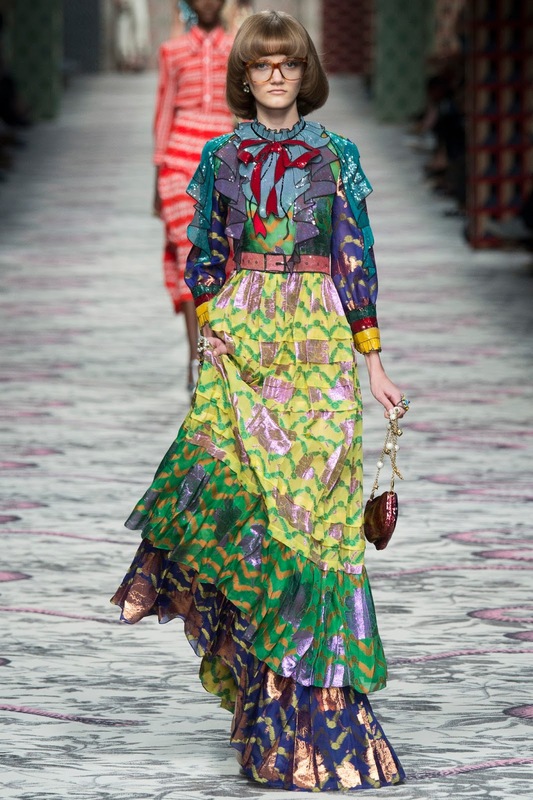 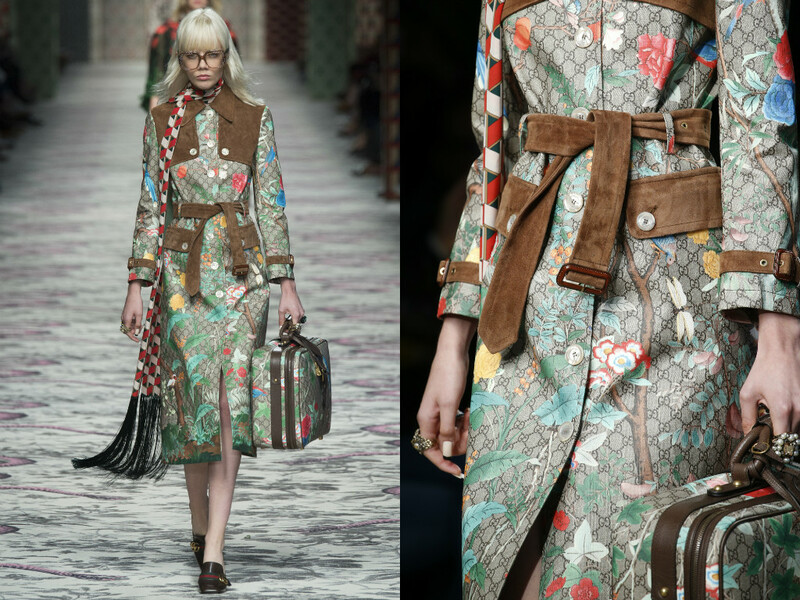 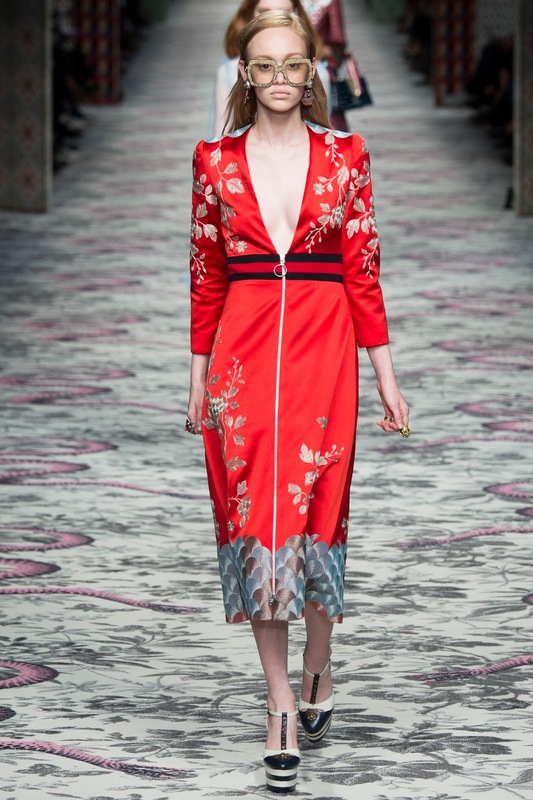 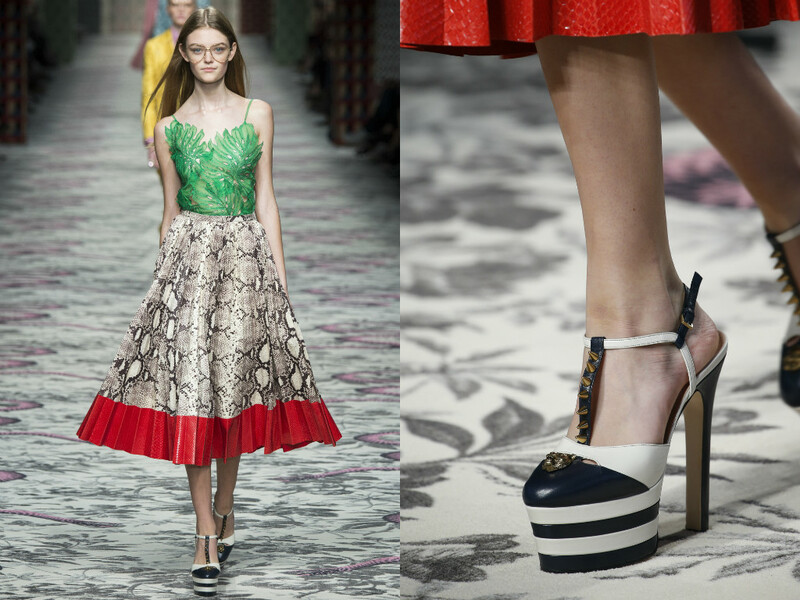 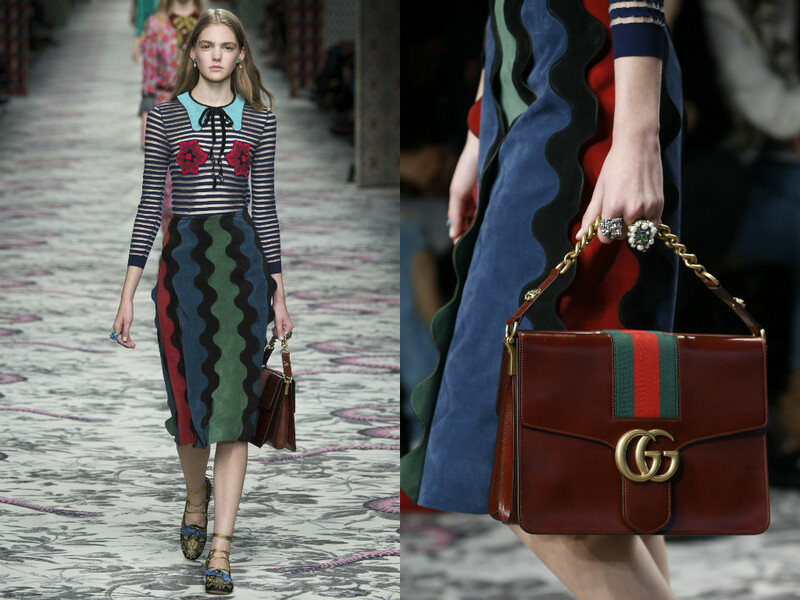 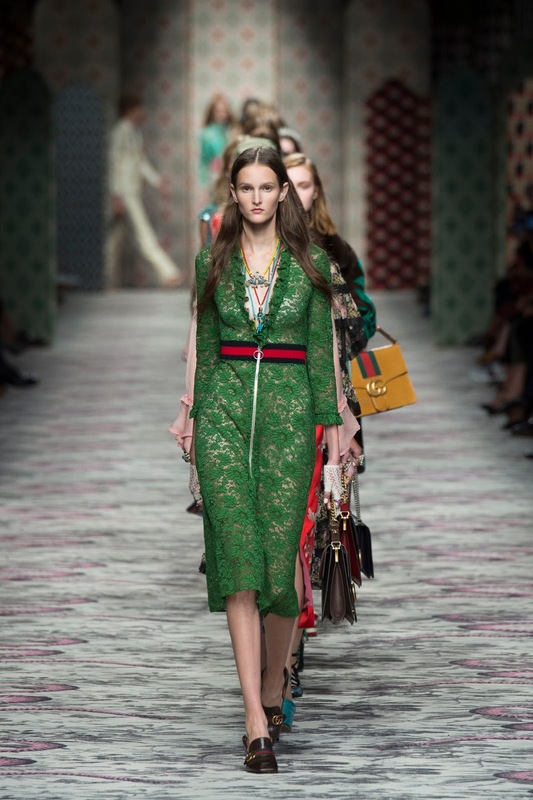 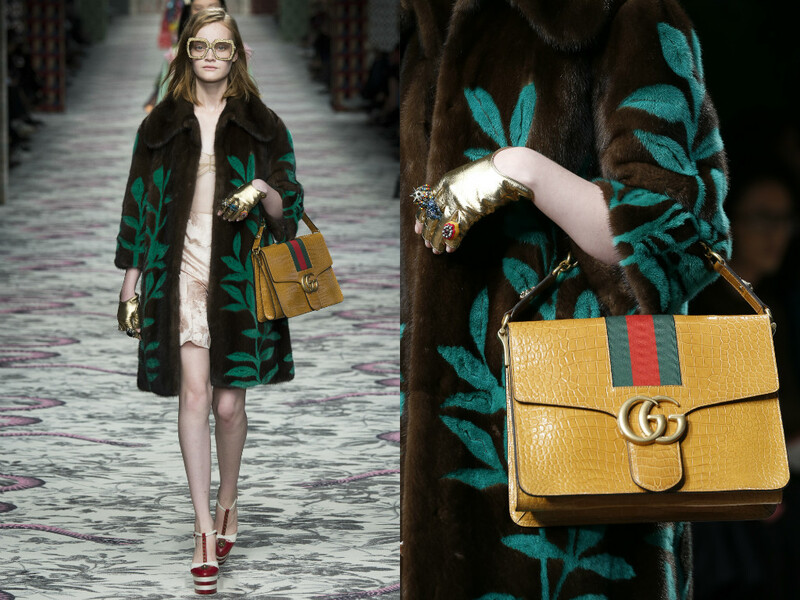 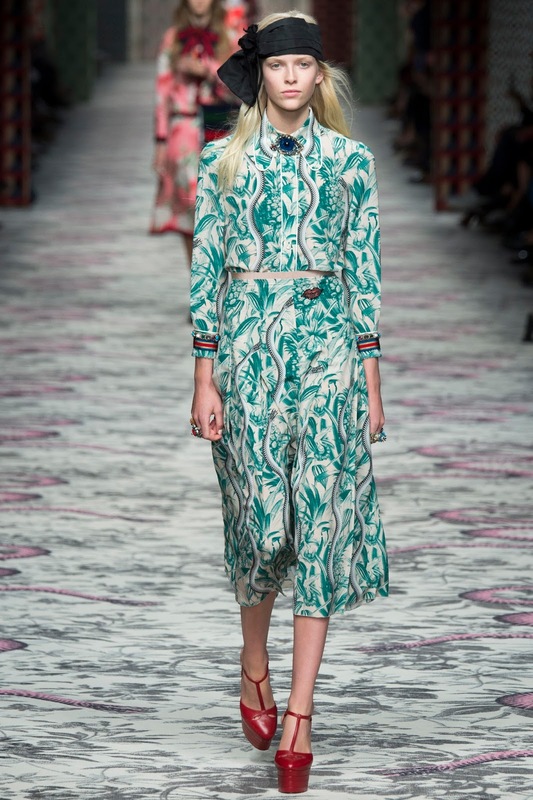 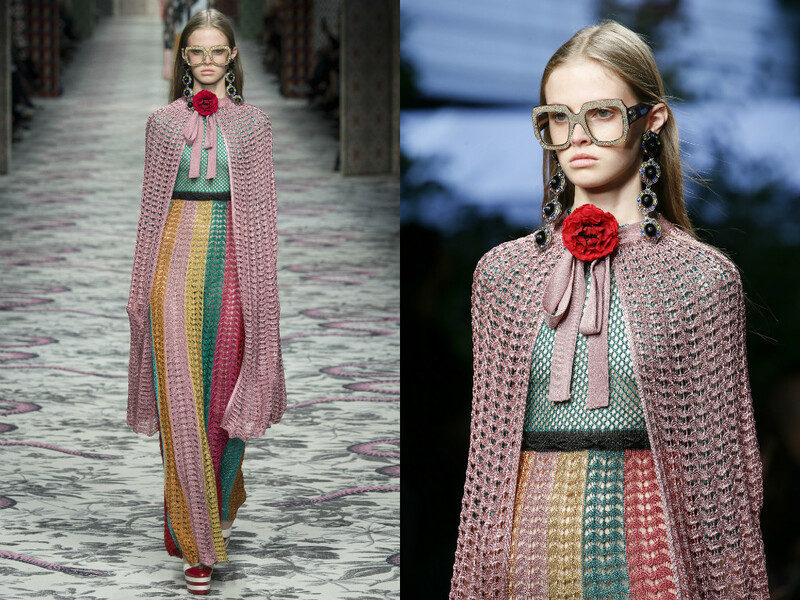 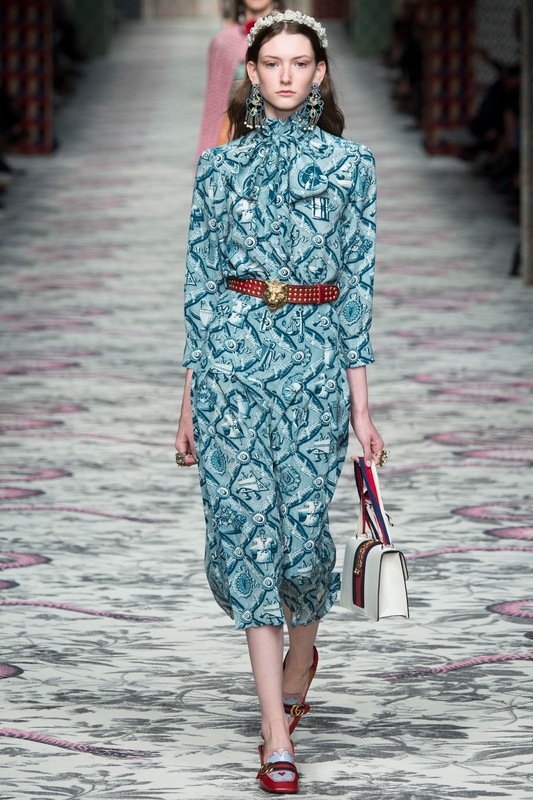 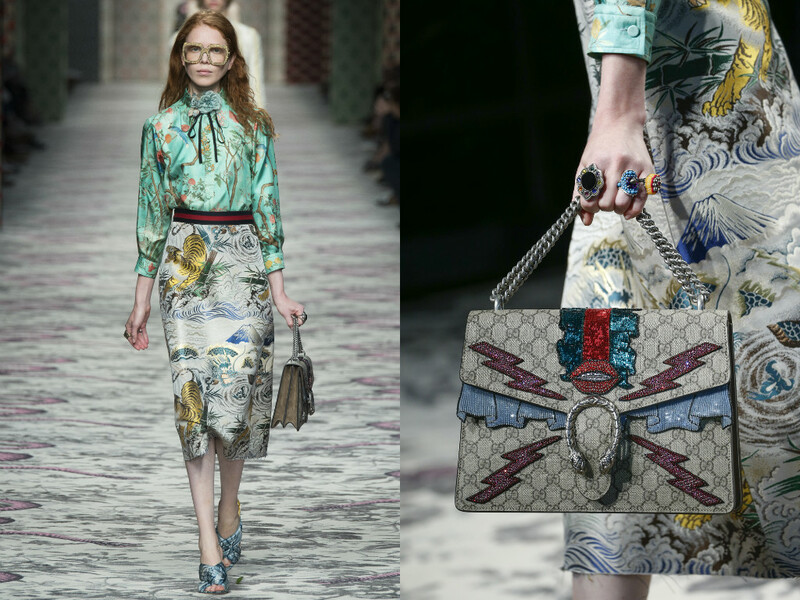 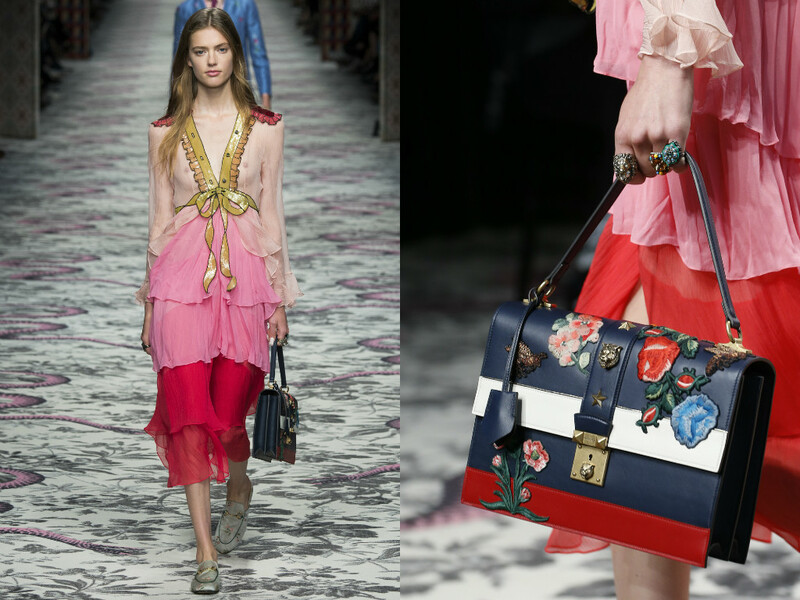 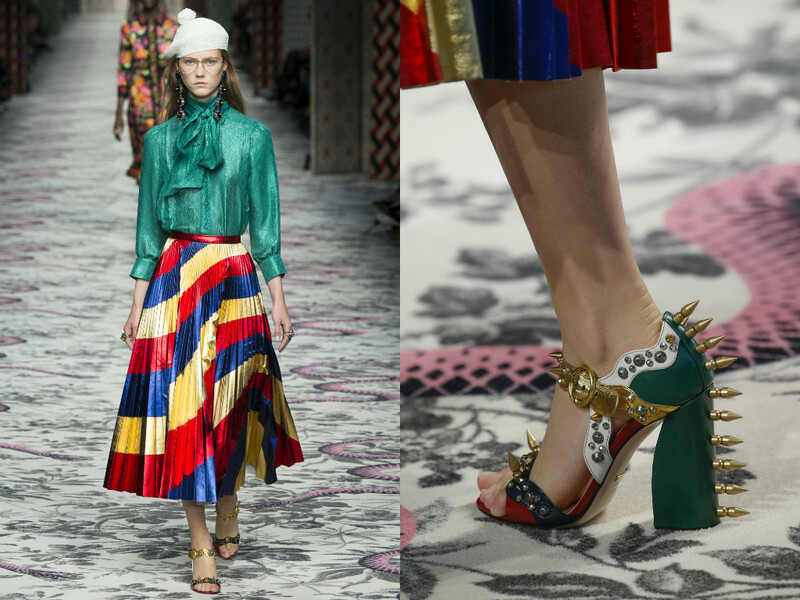 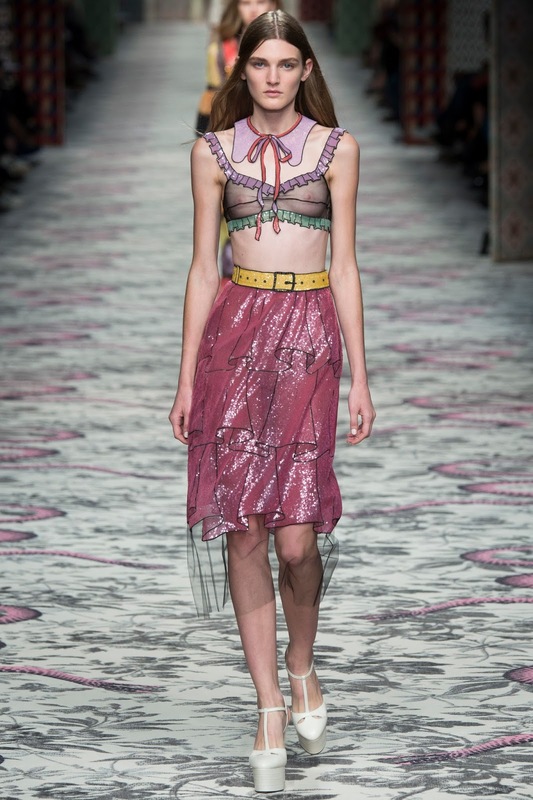 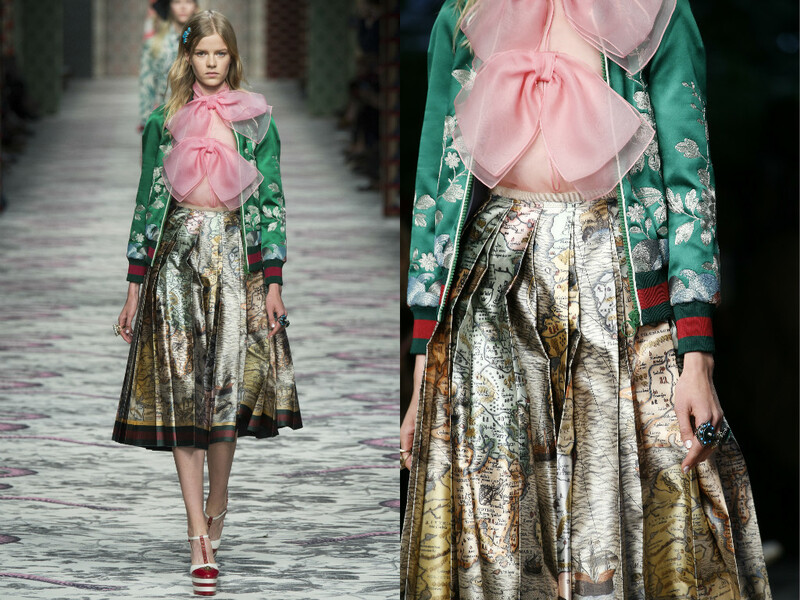 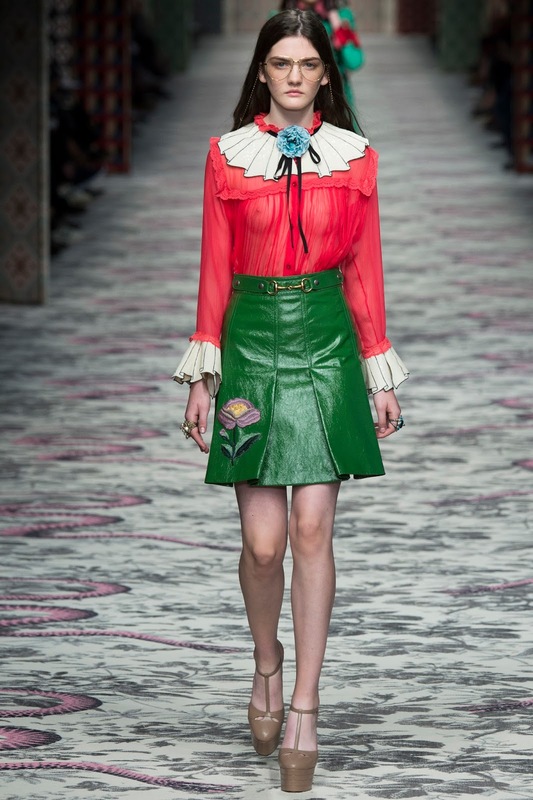 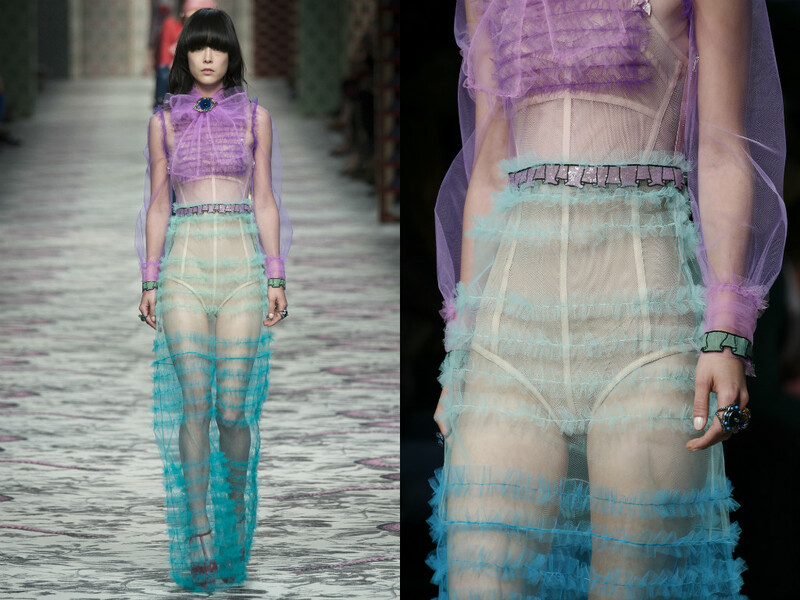 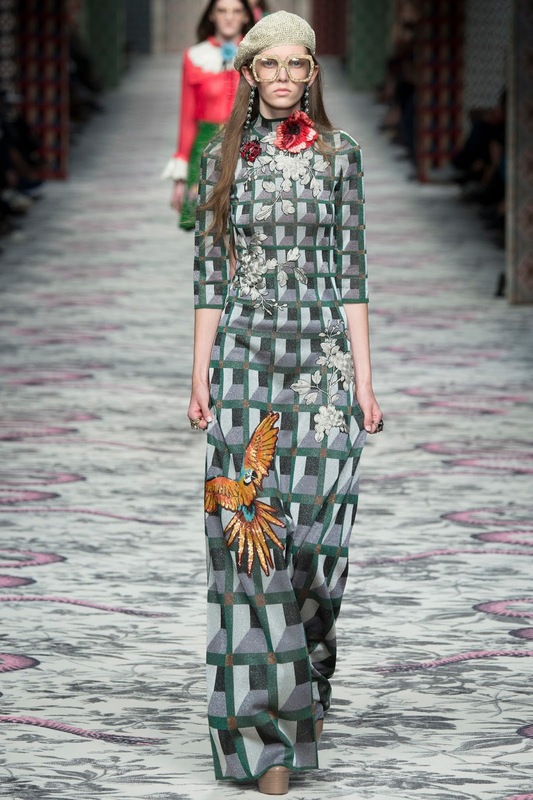 When it comes to Gucci, its all about mismatching and being you - what YOU think looks good. 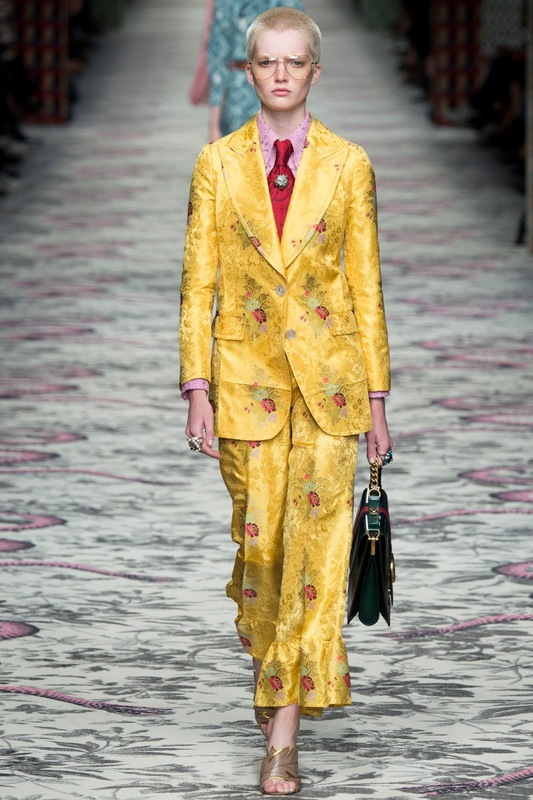 Thats what I love about fashion is you can express your own personality and be yourself and enjoy it. 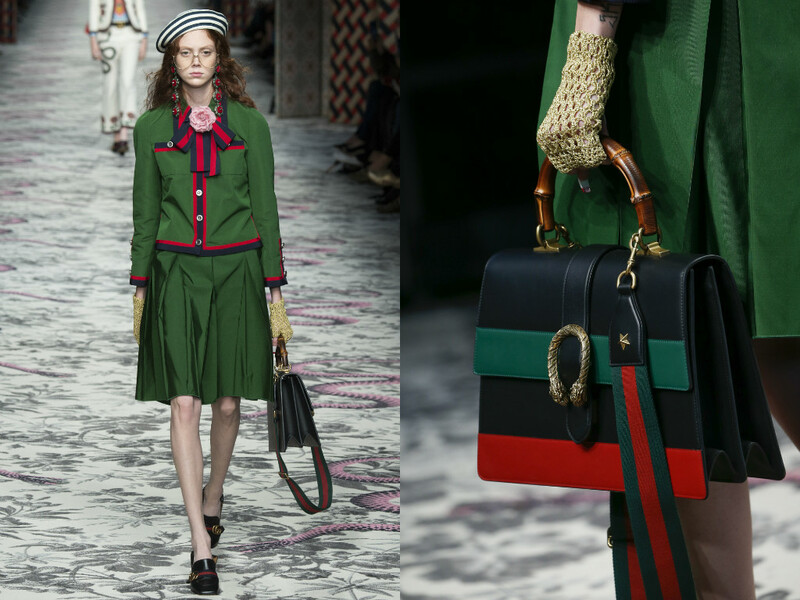 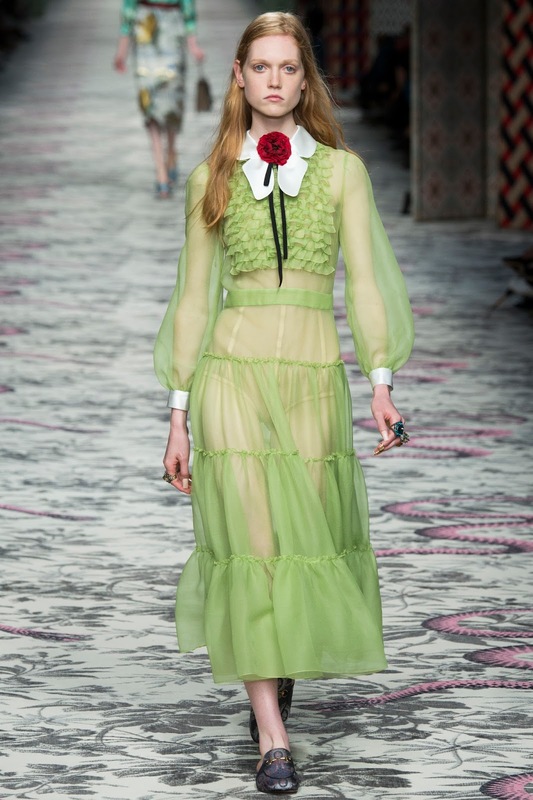 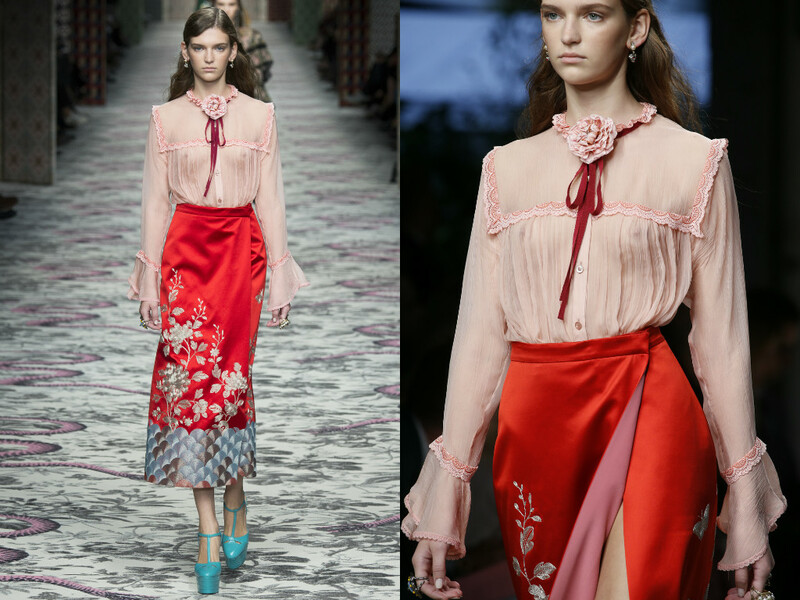 Alessandro Michele, the creative director of Gucci, has taken the brand and not only altered it, but completely given it a new vamp. 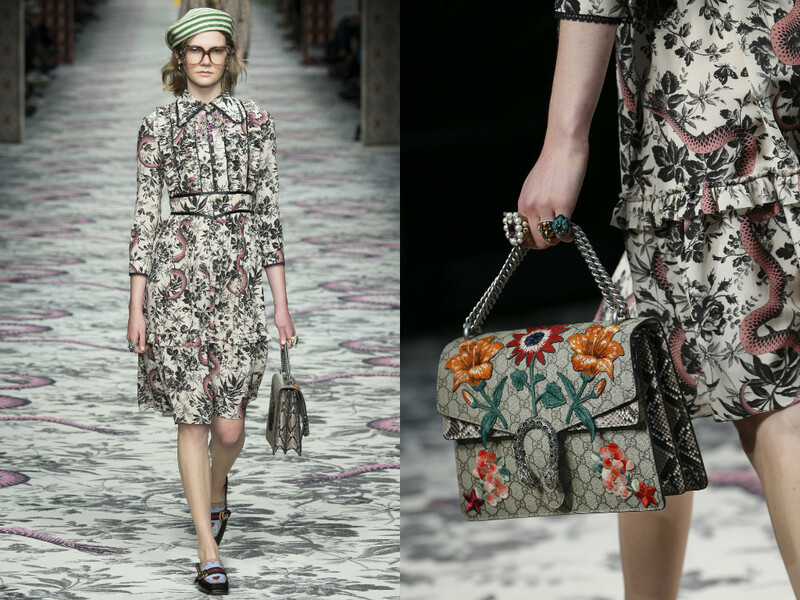 This spring collection was very much "geeky" and "vintaged" styled, which is perfect for the sophisticated Italian woman. 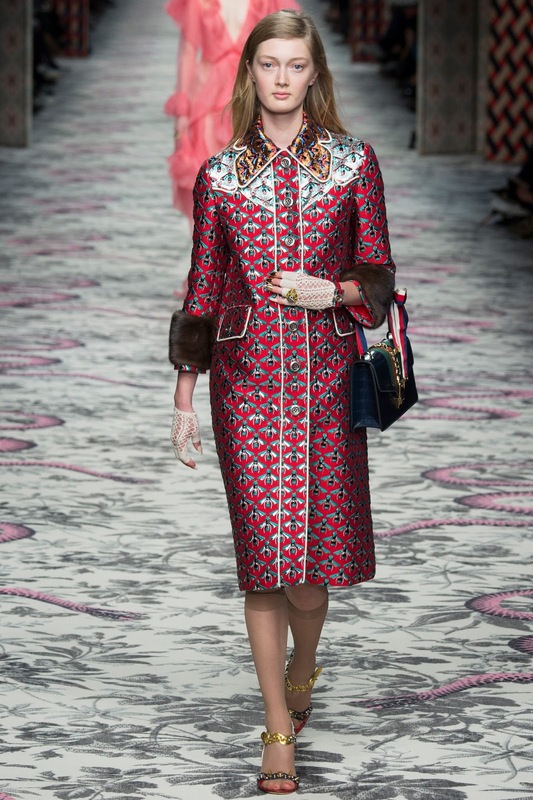 I was so happy to see two of my style inspirations, Dakota Johnson and Alexa Chung at the show. 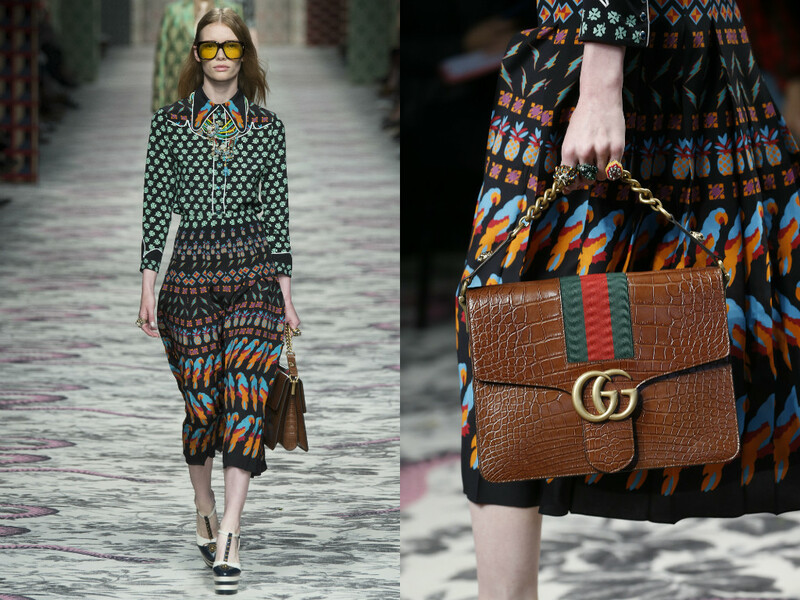 Looking gorgeous and every inch the Gucci girl. 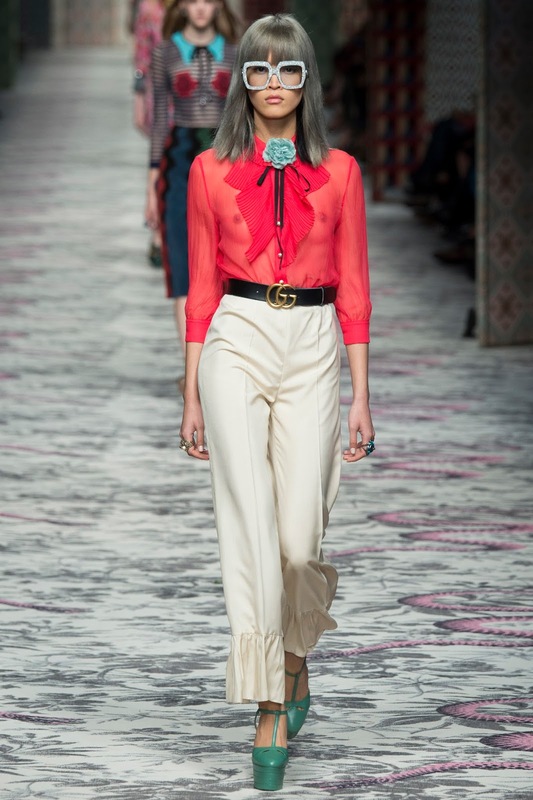 Alexa Chung, Dakota Johnson and Nathalie Love. 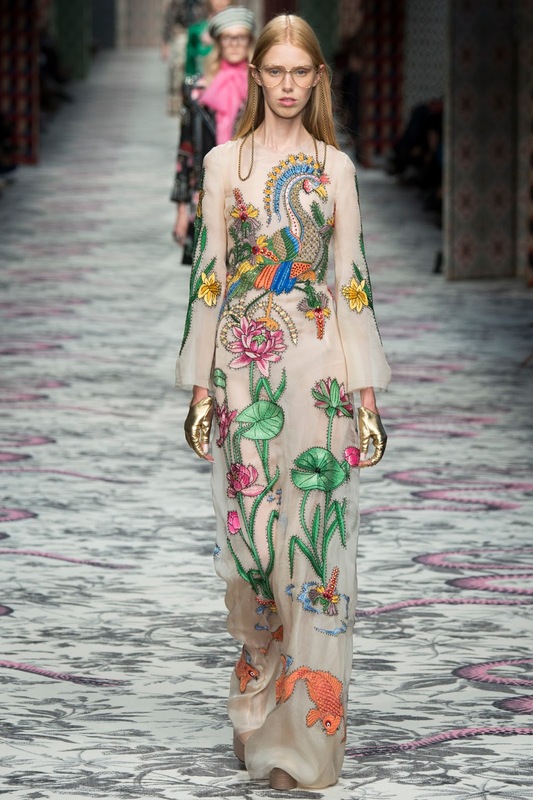 The show was very art driven, mind-blowing and very decorative. 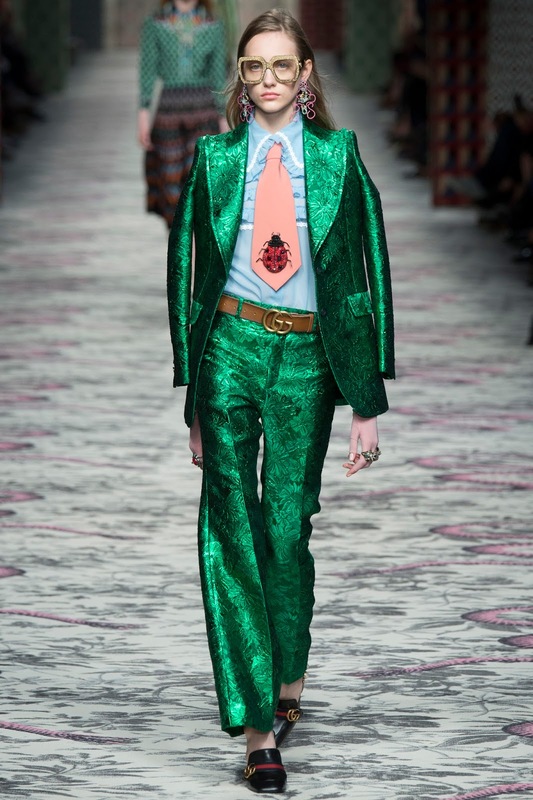 It's extraordinary and Alessandro has shown no boundaries. 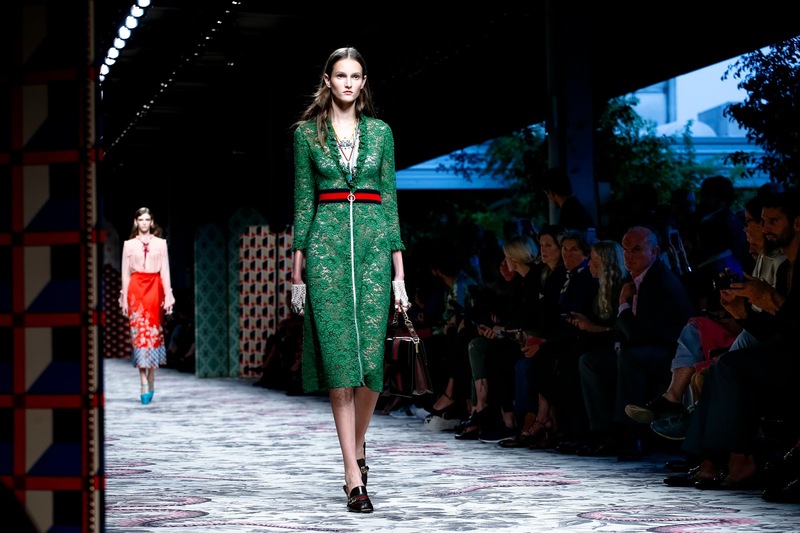 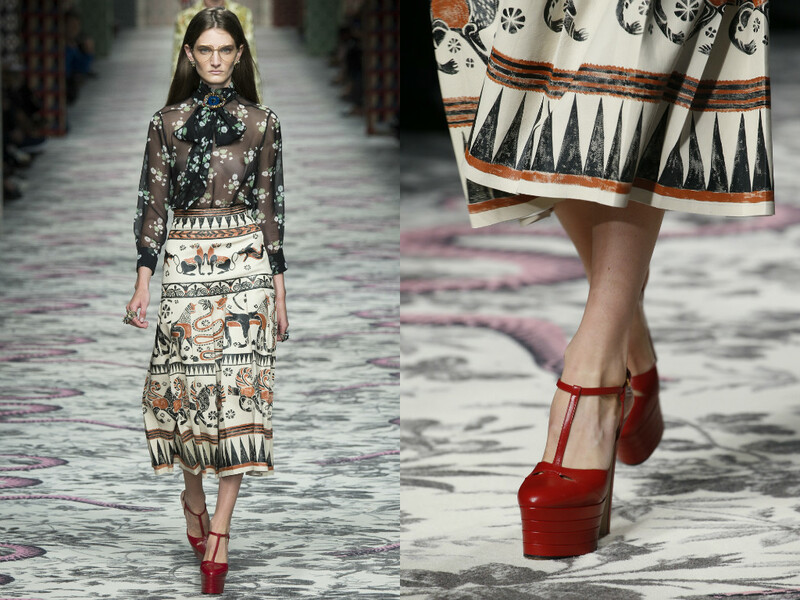 Encouraging the women who love Gucci, aswell as fashion, to be themselves and try out new things. 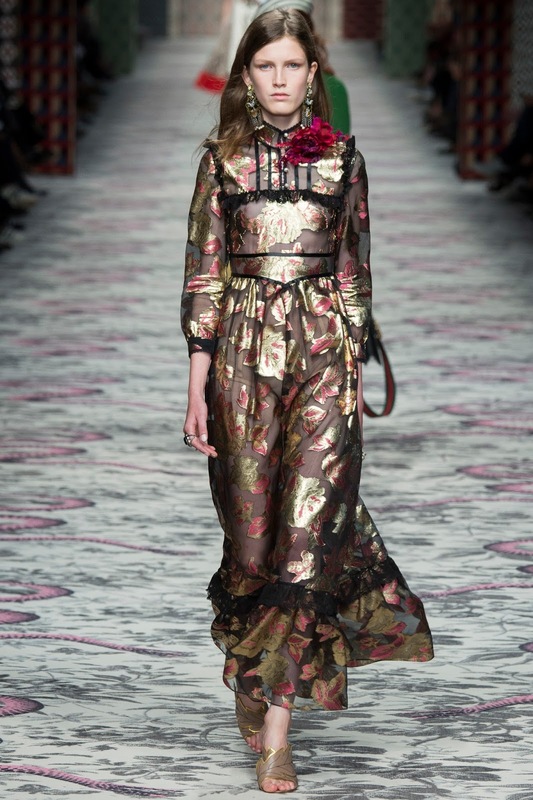 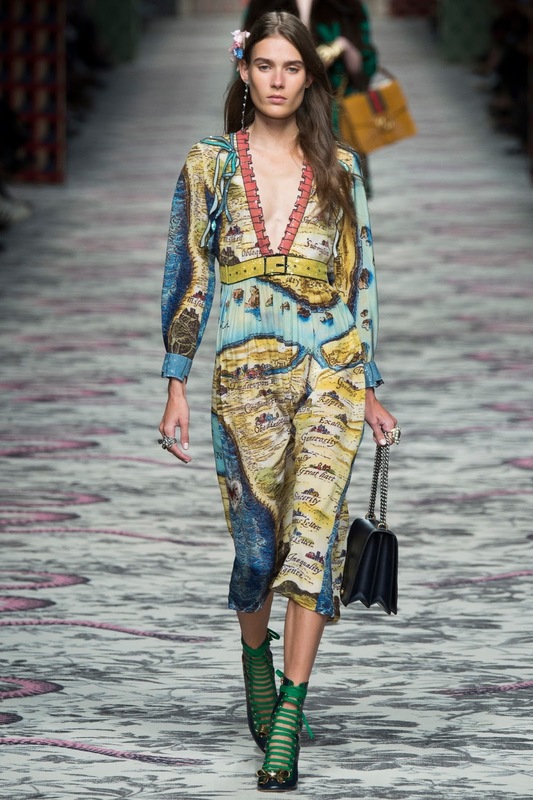 Likewise to Tom Ford's previous collection, this one was inspired by the 70s Flower Power era, and I think thats what will make the collection so popular this coming summer - as the 70s Bohemian and hippie culture is always reminisced in the Spring/Summer season.